As some of you may know, I broke two ribs while practicing on Lake Garda 10 days before the competition started. Three doctors have told me that any kind of exercise is not a great idea, but I feel OK, Pam and I are here, and the forecast is mostly for light conditions. I’m taking extreme care like having others help me rig and get my boat in and out of the water. Pam suggested that I follow the advice of our Italian friend Bepe and not take any more pain killers so I can feel what’s going on, which we thought was a good idea. The weather pattern for the week turned out to be very predictable – the cool offshore breeze in the morning would die as the land mass heated up, and sometimes the sea breeze would come in by 3 in the afternoon… and sometimes it would not. There are 348 Lasers launching on 4 tiny ramps, there is not enough room on shore, and the club has never had this many boats before. Add to this a really long 6 km (3.5 miles) sail to and from our race area, and we have an ongoing learning experience. Here’s how it went for our practice race. Mark Bethwaite (AUS) has won this event for the last 4 years and training with him in Italy showed that he’s again very quick in all conditions. Michael Nissen (GER) has come second in several worlds and is very fast. Alan Keen (RSA) has also come second several times and is particularly fast in light air. Several other sailors from Argentina, New Zealand, and Canada have had excellent finishes at previous world championships. We GGMs are the last to start and the line was long and I thought pin favored. Everyone started bunched up at the committee boat which I thought was nuts. So I started near the pin and tacked. The safest way for me to tack is to squat on my knees facing forward in the cockpit so there is no pressure on either side of my ribs. But it’s slow, so I could not cross a few boats that I should have. The conditions were 5-10 with lumpy open water waves from ferries and other traffic. This was the first time I’ve used the Mk2 sail in these conditions and it felt different for sure. Several people are using Brett’s settings, and the outhaul and vang were hard to get just right. A little body movement would have helped get through the waves, but this movement hurt a little so I did not do it. After a crappy mark rounding at the first mark, I was mid-fleet. Nothing happened on the long run and on the second beat, I played the middle of the course near Mark who had taken the lead. He was faster on this second beat which told me that others were also getting used to the conditions. Several boats that went right overshot the top mark which was the finish because of a shortened course, so I finished second about 30 seconds behind Mark. Had others not overshot the mark, I would have finished fifth. So, there is lots to work on and additional speed to be had. Racing starts today and the forecast is the same – light and lumpy with a chance of some rain which could kill the wind. We waited on shore for the breeze that never came. Light and variable conditions again. The cloud cover meant that there would be no sea breeze and again no racing today. Need clean air at the starts because the boats may all try to be in the same spot. Need to protect the right because some say that this is the favored side. Need to watch and learn to get more speed as these conditions are quite different. With the Mk2 sail, need more vang and less foot than normal. On the run, need to work the waves like Pavlos Kontides (who won the Laser Worlds here last week), see how he plays small waves here at 11:00. Most importantly, need to get good results quickly. The two times I’ve won this, was leading after the first day. The forecast is for continued light winds, so with an unknown number of racing days, an early leader could be hard to catch. Three races are planned for tomorrow. The Swedish team with their trainer. Pam put me back on pain meds because my side was tight, and we left the harbor at 10:30. The forecast was for a gentle offshore breeze that was to be killed by noon followed by a gentle 6-8 knot sea breeze. I bought myself a new light air mainsheet but took out my old mainsheet and hiking pants just in case. 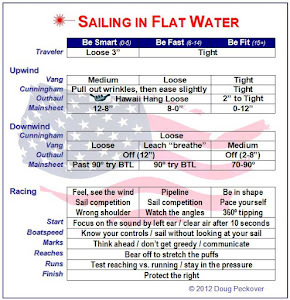 That saved my bacon because when the sea breeze kicked in, it was 15 knots with a steep chop when we started at 3:00. I went upwind before the start to try hiking for the first time since breaking my ribs. It felt OK but I did not want to do any lateral movement to help the boat though the waves. It felt slow but I was very happy just to be there. The line was pin favored so I started 3 up and tacked to go right as soon as the boat on my hip tacked. Michael Nissen (GER) played the middle and led John Pitman (NZL) and Mark Bethwaite (AUS), so I rounded 4th. There were good waves to catch on the run but I was not comfortable playing them. The positions remained the same until the second run when Alberto Larrea (ARG) tried hard to blanket me from behind, and it was good to hold him off. But I could not hold off Robert Blakey (NZL), so my first finish was a 5th just ahead of Alan Keen (RSA) and Alberto. Felt OK but was a little nervous about 2 more races. The sea breeze started to die so the second race was about 12 knots with the same steep chop. It was committee boat favored, so I started at the boat with Michael just below, and tacked to go right which felt like the lifted tack, and he followed. Over the next few minutes, he pointed higher and slowly rolled me. Mark was leading and would go on to easily win, and there were about 5 boats just ahead of me at the first mark. On the run, sailing by the lee worked better than heading up to catch waves. On the second beat, the breeze was down to about 10 so hiking and body movement were not as important, so I was pleased to round the top mark in 2nd just ahead of Michael and John. Was barely able to hold them off on the top reach, and Michael and I were even for most of the run until he caught 2 waves to move ahead. John was off to the side playing the waves and also moved ahead, rounding just ahead at the bottom gate. Both stretched out on the bottom reach, and I was able to hold off Alan on the final beat to finish 4th. Thankfully, there was no third race and we got back to the harbor at 6:00. I can hike – yea! The compass worked well with 10-20º shifts. Taking out 2 sets of equipment. My reaching was bad and made me vulnerable. This fleet is small but really competitive. The forecast for the rest of the week looks the same, so I’m not sure if it will be the gentle 6-8 sea breeze or the 12-15 workout we got today. There is a 3-way tie for first between Mark, John, and Michael with me in 4th. The results can be seen here. Some of the coach and judge boats. For me it was groundhog day – same incorrect forecast, we started and ended at the same time, we had the same leaders, same positions, and am still trying to hold off Alan Keen (RSA) for 4th position. The sea breeze kicked in and I changed on the water into my warmer gear and hiking pants. It was pin favored and I started 4 up, watching Mark Bethwaite (AUS) fight for the pin which I thought was an unnecessary risk given his speed and the length of the line. When he tacked onto port, we were even and he ducked me. I followed going right and he had better speed in the choppy waves. Mark led at the first mark and stretched out to win again easily. Michael Nissen rounded in second with me next. These positions stayed the same on the run and for most of the next beat. Before the race, I had talked with Brett Beyer (AUS) who said that he favored the right because it was closer to an island and there might be more pressure there. On starboard below the layline, a port tack boat leebowed me, than another leebowed him, and this repeated until we had 4 boats pinching below me in the waves. I could not hold on and tacked away, so for me playing the right did not work (Brett scored two bullets today in his fleet, so it worked for him). Was slow in the top reach, OK on the run, and then slow in the bottom reach to hang on to 5th. Alan Keen (RSA) finished just ahead. I decided to not take any pain meds or have Pam tape me up (kinesio, not compression), and felt a little stiff. The next race was again pin favored and Micheal won it. He tacked and crossed me and I followed. He footed while I pinched a little because of my limited lateral movement through the waves. 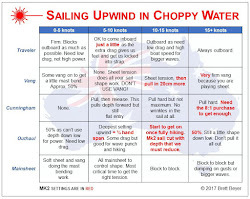 We sailed through the 68 boat GM fleet coming down the course on a run and he had to dodge more boats, so by the starboard tack layline, I was ahead while many of the boats on my hip had overstood the port tack layline. At the top mark, James Temple (AUS) approached on port, aiming for rounding the mark within the 3 boat lengths. I said “keep going, do not tack” which he can do if I do not have to alter course. But he tacked right in front and I had to head up to avoid contact. It was one of those “you know better than that” moments which was frustrating because (1) he did not do his circles and (2) it would have been the only time in the championship that I had the lead. On the run I went to the left with Michael right behind, but looking at the flag at the top of the mast told me that this was a mistake because the wind was coming over my right shoulder, so going right would have had clear air. Was able to hold off Michael and a bunch of others and took the left gate with James just ahead while Michael took the right gate. On port tack, tried to sail with James but he pinched hard to slow us both down. I disagreed with this tactic because the leaders usually work together to get ahead of the pack. So I slowed down, cleared his stern, and footed to the right. Near the starboard tack layline I tacked to clear James but John Dawson-Edwards (CAN) had sailed well to move into 2nd place behind Micheal. All of this time Mark Bethwaite (AUS), who had not been a factor because of starting at the committee boat end of the line, was moving up the fleet and was in 5th place. On the top reach, he passed James and me so I was now in 4th. Alan Keen (RSA) caught up on the long run. If he passed, he would be in 4th overall, so my strategy was to stay in front of him. Just before the button mark, I had a large wave that would shoot me ahead but my bow dug into the next wave and my cockpit filled up with water. Damn! So the bottom of the run was focusing on carving speed to keep the bailer working and not VMG speed. James passed me so on the bottom reach, I was between him and Alan. On the bottom reach, James went high to again block me so I went low to pass him and stay with Alan who went even lower. I rounded the final mark just ahead of Alan and he initiated a tacking duel on the final short beat. My ribs said no but the score said yes, so I responded and we finished 4th and 5th. So I’m still in 4th place but my ribs are definitely saying “don’t to that again.” Our results so far can be seen here. In the Grand Master fleet Al Clark (CAN), Andy Roy (CAN), and Peter Vessella (USA) are having a great battle at the top of a very competitive fleet. Their results can be seen here. Lots of time to listen to music and hang out with friends. Hugh Leicester, our excellent PRO, sent us out and we waited until the sea breeze came in, and we started at 4:00. To me, the pin looked favored so I started there with most of the fleet starting at the other end. On the long starboard tack, the pin boats gradually lifted and I waited for the knock that never came. I tacked near the port tack layline and looked pretty deep, with Michael Nissen (GER) leading the boats who started at the other end. Could not find a good lane on starboard and rounded 8th, my worst start in the regatta. We were sailing the outer course so the next leg was a reach. Several boats behind me went high and James Temple (AUS) blocked me from joining them, so I faked him out of the way and went low. But no progress was made there either. On the run, went right to get clear air but lost 2 more boats. At the bottom of the run, Alan Keen (RSA), who was just one point behind me in 5th place overall, was sailing really well leading and I was now in 10th. Not a good race so far, so I needed to try something different. Rounding the bottom mark, most took the right gate so I looked for some separation, went left, and banged the right side of the course. Three boats were passed mainly because of clear air and good speed, not shifts or pressure. Rounded the top mark in 7th. Boats going downwind for some reason went left so I sailed straight for the mark, sailing by the lee as much as possible. It worked and I moved into 5th place right at the bottom mark, and that’s how I finished. Michael passed Alan to win. In doing so, Alan only gained 3 points on me to put him 2 points ahead in the overall standings, a more manageable result from a frustrating race. It also gave Micheal the overall lead in the championship as Mark Bethwaite (AUS) finished in 3rd place. We have two more days to go, our results can be seen here. We went out and waited for a few hours in marginal conditions, and then came in again. There was no racing, and we have one more day to go. Two worthy champions - Michael and Mark. For the final day, Pam medicated me again, we left the harbor at 10:30, and we waited until just before the 3:00 deadline to start racing. Being in a safe 5th place overall, I decided there was nothing to lose by sailing hard for this final race. Michael Nissen (GER) was leading defending champ Mark Bethwaite (AUS) by one point, John Pitman (NZL) was in 3rd, while Alan Keen (RSA) led me by 2 points for 4th place. It was about 10-12 knots with a pretty steep chop. I started at the boat with Mark just below. Michael started further down the line, tacked, and would have crossed both of us. I did not want to interfere with the two leaders so I tacked and Mark followed going right. I was pointing higher than Mark and would have been directly in front of him, so I footed a little to not interfere with the leaders. Mark tacked onto starboard and Michael tacked just below him. They were very close. At the port tack layline, Mark was in control and led Michael back on the port tack. Ahead was John and Alan leading at the first mark on starboard. As I approached on port, I tacked trying for the lead, slipped and fell on my side (ouch), regained control, and rounded a close 3rd ahead of Mark and Michael. On the run, Mark and Michael chose to not engage while I played the middle and took the lead by leaning forward on larger waves to stretch the surfing. I took the left gate with Michael right behind, so Mark took the right gate to get some separation. We went right and by the top mark, it was me, Mark, and Michael. On the top reach, I again had speed problems and Mark passed me to windward to take the lead – the top reach had been a problem for me all week. On the run, I again had good speed and passed Mark, so at the bottom of the run it was Mark, Michael, and Alan rounding in a tight group right behind me. Mark went low on the bottom reach while Michael went high to defend against Alan. As we rounded the final mark for the short beat to the finish, right behind me it was Michael, Mark, and Alan. If we finished in that position, Michael would win the championship, Mark would be second, John third, me forth, and Alan fifth. But the race was not over yet. The danger for me personally was that if Michael and Mark went after each other on this the final leg, they could allow Alan to move into second place which would keep him ahead of me in the overall standings. And this is what happened. Much more importantly, the overall winner would be determined in the final minute of this race. Mark had no option but to tack onto starboard and Michael followed with what he later described as a really bad tack, while Alan followed me to the starboard tack layline. I watched through the window of my sail as Mark tacked on the port tack layline. Had he crossed Michael and stayed ahead of Alan, he would have won the championship, but he could not cross Michael. To remove any doubt, Michael clipped the end of Mark's boom and Mark had to do a 720. So the finishers were me, Alan, Michael, and Mark, making Michael the new GGM world champion. All of these gentlemen were a pleasure to sail with. Our final results can be seen here. It was also the end of an interesting winning streak. 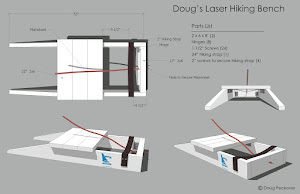 Keith Wilkins (GBR), Mark Bethwaite (AUS), Wolfgang Gerz (GER), and I are all about the same age, and in spite of really good sailors turning up each year, one of us had won a Laser Master World Championship every year since 1991. Michael ended the winning streak this year and, perhaps not surprisingly, is Wolfgang’s training partner in Germany. Great stuff as always. Thanks for reporting.